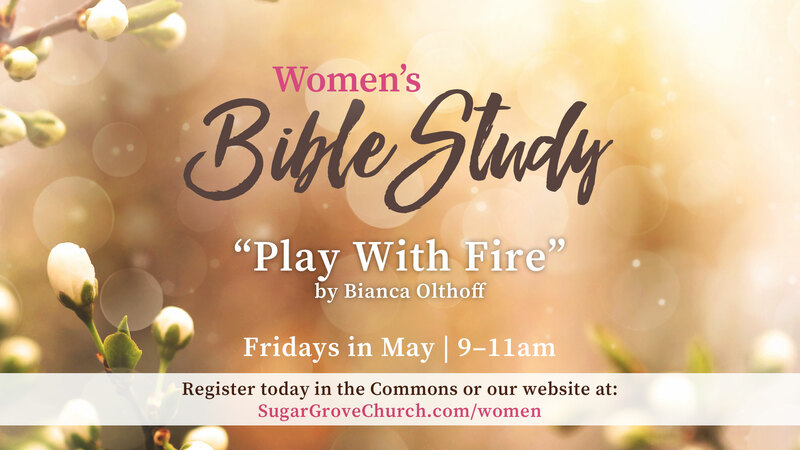 Ladies, we’re excited to offer “Play with Fire,” from popular speaker and teacher Bianca Juarez Olthoff. This Bible study reminds readers that God isn’t waiting until you have more resources or a spouse or a job so he can use you. He’s ready to use you now. In Bianca’s words, “He’s whispering in the wind and speaking through the fire and shouting in silence the extraordinary dream He is birthing in you. His dream for you is far greater than the dream you have for yourself. It’s not your identity or income or influence that will make this happen. Like Zechariah 4:6 says, “‘It’s not by might nor by power, but by my Spirit,’ says the Lord.” It’s time to play with fire. Bible study will meet in the Student Center, Friday mornings (9–11am) throughout the month of May. Childcare is available. The cost for the book is $6.00 (which will be collected at the Bible Study).